London, 26.05.1743, New South-Sea Annuity über £ 115.7.6, #699, 9,3 x 17,7 cm, schwarz, weiß, Büttenpapier, Knickfalten (ein Einriss hinterlegt), links oben restauriert, Erhaltung VF, OU. Die früheste New South-Sea Annuity, die wir bisher in einer Auktion anbieten konnten! Rarität aus einer alten Sammlung! London, 26 May 1743, New South-Sea Annuity for £115.7.6, #699, 9.3 x 17.7 cm, black, white, laid paper, folds (one tear underlaid), restored in the left upper part, original signatures. Annuities at that time were perpetual (non-redeemable) loan stocks. 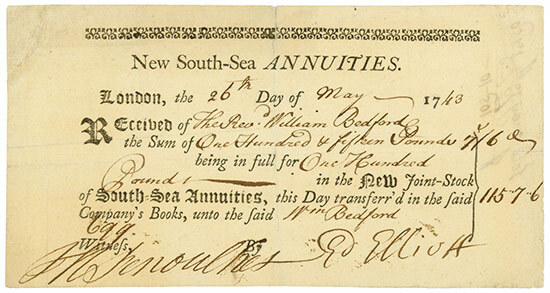 The earliest New South-Sea Annuity we could offer in an auction. Rarity from an old collection! The South Sea Company was founded in August 1711. The company used its foundation capital to buy state debt, and in return, it received numerous privileges for trade with South America. Until then Spain had been the supreme power there. However, in its first two years, the South Sea Company’s only income was six per cent interest from the state. In 1713, the company acquired the right to the ‘Asiento’, which had been granted by France to Britain in the peace of Utrecht. Under this agreement the South Sea Company was allowed to deliver 4,800 slaves yearly to the Spanish colonies. Thereafter, the company and the price of its shares slowly gathered momentum. Before, the share price had languished for a long time at 75 to 80 per cent of the issue price. The price did not start to boom until the start of 1720, when it became known that the South Sea Company would accept further state debts in payment for its shares. At the same time, it reserved the right to increase its capital as often as it pleased. Furthermore, it was free to choose the issue price. In the following months, the stock price boomed to more then 300 per cent. Other very successful share issues followed. At the beginning of July 1720, the stock climbed to 800 per cent. In the same month, a mega emission of five million at the phenomenal price of 1,000 per cent was carried out. At the time, the London Journal wrote: “The turmoil of our wave makers at the stock market was so big, that it exceeded all of the until now known dimensions. There was just a running from one coffee house to another, from one tavern to the next, to draw shares and to sign them without verifying the brochures. The general call out was ’For God’s sake, let’s draw and sign, it doesn’t matter what!’” In the shade of the South Sea Company, many more companies were promoted and a few were established. In his book „The history of economic crises“ published in 1874, Max Wirth identified 202 such “Bubble companies”. Back to the South Sea Company: In July 1720, with the price at 1,100 per cent, the party was over. The first sellers trampled on the plan. Already one month after it had reached its peak, the share price lost a third of its value. Two months later, it stood at one tenth of its record high. Speculators who had borrowed to buy the shares were buried under their debts, diverse banks held back their payments and the Bank of England itself got into trouble. It was the first time - and as the Nasal has verified again, not the last time in history - that a large part of the public lost everything in a speculative rush. But the South Sea Company was too big to be allowed to fail. Thanks to major recapitalization measures by the government the company survived the speculation bubble and continued until 1853, although in its last years it did not trade and its main function was to service government debt.